Can you believe it, Jeni's Splendid Ice Cream store in East Nashville is 1 year old! Yes, a whole delicious year old! In celebration of this big event, Jeni is offering by the scoop a limited time only (Friday June 29 through Sunday July 1) Yazoo Sue and Rosemary Bar Nuts ice cream. So, find a parking spot, get in line, and get yourself some of this ice cream. The ingredients in Yazoo Sue start out with Linus' Yazoo Brewing Company cherry wood smoked porter and then the porter ice cream is layered with brown sugar, rosemary, cayenne, toasted almonds, cashews, peanuts and pecans. Remember, it is only this weekend, so plan accordingly. I blame my pals Tanya and Peg for telling me (insisting really) that I had to try Jeni's because it is the best ice cream they have ever had. I did not believe them because I know ice cream. I resisted for months. Look, I have lived amongst the best ice cream in the nation. There could never be any ice cream better than those I had before, or so I thought until now with Jeni's. I lived ice cream, I lived next to the best ice cream, I love ice cream. I scooped ice cream at a boutique Boston ice cream store while in high school. If you remember, I have traveled to and lived at Penn State, Zanesville, Northampton, Pittsburgh and Philadelphia where the top 5 rated ice cream joints in the USA. While at PennState, every Thursday, I had to walk diagonally across campus straight through the PennState Creamery. So after my class at 4 pm, I would always always get a treat, such as strawberry yogurt or chocolate ice cream. The PennState Creamery is the place where they know ice cream since 1892. The PennState Creamery has taught the Who's-Who of ice cream including Baskin-Robbins, Ben and Jerry's, Haagen Daz, Friendly's, Dreyers, Breyers, Blue Bell, and a host of other big name ice cream makers. I held PennState Creamery as the gold standard for ice cream. Then, one fateful day, after the insisting and chattering and more insisting from my friends, we went to Jeni's. We got this little 1/2 cup portion for $4.92. I got cherry lambic and mango lassi, and the man got milk chocolate and coffee. The man too knows about ice cream, and lived amongst the top 5 ice cream joints in the nation as well. And we both said, "This is the best ice cream I have ever had!" Then a couple months later, I was hanging out with my pal from the PennState Alumni Club, and I was chattering about Jeni's ice cream, and then these words come out of my mouth, "Jeni's ice cream is better than PennState Creamery!" My pal took one look at me and said, "Wash your mouth out!" Ok, so I did with another bite of Jeni's. And we agreed that Jeni's isn't a custard based ice cream, rather Jeni's is cream cheese and corn starch based, so it is like comparing apples to oranges. Lucky for me, Jeni's is open 7 days per week until 11 pm. We have been known to jump in the car at 10:30 pm on a Sunday night for a cup of Jeni's. I will see you there this weekend for a little Yazoo Sue! I really like Sperry's in Belle Meade. There is the traditional warm wood and leather decor, traditional steak and and seafood options, and a really rocking salad bar. The last time we were there, there were multiple tables of celebrating family birthdays. Sperry's brings my mind back to when I was a kid growing up in L.A. and I wanted to go to the original Brown Derby Restaurant, shaped like a brown derby hat on Wilshire Blvd. The interior was lovely wood with dark burgundy red leather circular booths. I still remember this dinner with my Aunt Judy in town, and she got salmon with cream sauce on it, and I got prime rib. I only got to go there once before L.A. progress took over and demolished the historic restaurant and put yet another L.A. multi-story strip mall. 1. On Twitter, tweet "@SperrysDining I want to win a free Sperry's Kobe Burger Dinner" everyday starting today June 24 through June 27. Tweet this 3 times per day to increase your chances to win! 2. Get on Facebook have 2 ways to win. Go and LIKE Sperry's Facebook page and SHARE "I want to win a free Sperry's Kobe Burger Dinner"
Good luck! and see you at Sperry's! 20+ Food Trucks, Carts and Trailers from Some of Nashville's Most Creative Chefs...All in One Location! Mark your calendars and start your engines! 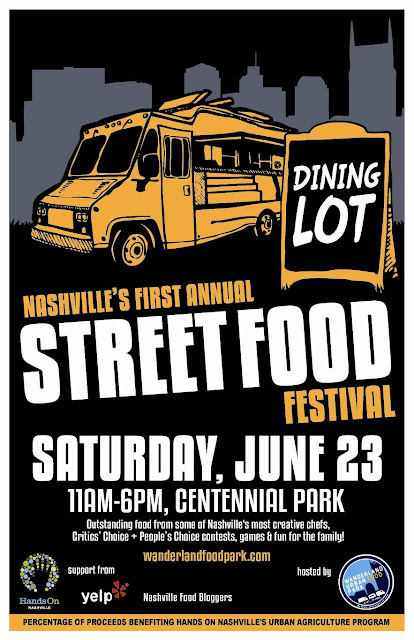 Over 20 of the most loved local and regional food trucks will be rolling into Centennial Park on Saturday June 23rd 2012 from 11:00am to 6:00pm for the inaugural DINING LOT: Nashville's Street Food Festival! Treat yourself to incredible food, contests, games and fun! This is a Family Friendly event you won't want to miss and children 6 and under are free! Dining Lot was conceived and organized by Wanderland Urban Food Park, Music City's only event management company specializing in working with Mobile Street Food Vendors. Wanderland is proudly donating a portion of the event proceeds to Hands On Nashville benefiting their Urban Agriculture program. Please visit our ticket page here. Tickets will also be available on site, the day of the Festival. But get yours now for the discounted price and access to all food vendors, as well as games and activities! Note the cost of food is not included in the ticket price. @WanderlandNash on Twitter for up to the minute Festival news!